One Red Sox question that should have a fulfilling answer: How much better can Mookie Betts get? The 23-year-old outfielder was already one of them most valuable players in the American League last season. On most days, I’ll happily match sappy paeans to spring training’s powers of renewal with any incurable baseball sentimentalist you can muster. In the emerald green fields/Beneath a stolen golden sun/Where no dreams will yield/And even the Molina brothers can run! Eh, I’ll work on it. In the meantime, let me address a more practical truth: Spring training is about renewing the compelling quest for answers more than anything else. 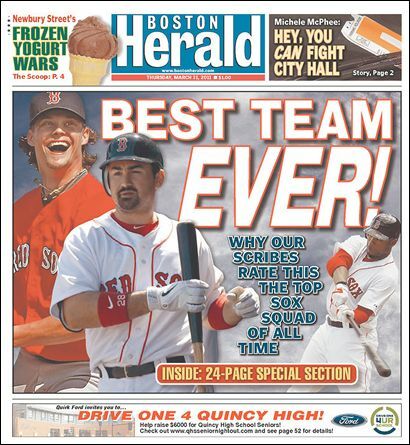 There have been a few seasons in the past decade or so in which the Red Sox have matriculated to Fort Myers with a roster instantly ready to contend for a championship: 2004, for sure, and 2008, and even the Best Team Ever Sox of 2011, who breezed through the summer before swallowing their tongues in that sad punch-line of a September. But in most years, there are a few significant questions that must be resolved, and if the answers don’t become apparent in the spring, there are at least clues found on the way toward Opening Day. This new edition of the Red Sox happens to have an inordinate number of questions: Can Travis Shaw usurp Pablo Sandoval at third base? How will the rotation line up behind David Price? Will Hanley Ramirez remember to bring his first baseman’s mitt to work every day? Thus far, the answers to those three questions appear to be: Shaw, the 25-year-old with the .715 career OPS in Triple A, is going to get a chance because Sandoval is generously handing him one … Who the hell knows, but the plan apparently involves Clay Buchholz as a No. 2 starter, which isn’t good … Hanley isn’t only bringing his mitt to work, he’s utilizing it with surprising competence. The Red Sox have many more questions – too many more – beyond these. While I’m sure I’ll get some grief for saying what I believe rather than saying what I believe will get the biggest reaction, I figure if half the breaks go their way and half don’t – you know, say Joe Kelly wins 15 games but Rick Porcello ends up as the most expensive long reliever in baseball history – this is an 80-something-win team. Eighty-six, maybe. Steal a few beyond that, and they’re contenders, right? It must be noted, however, that there are questions that don’t insinuate the possibility of a negative outcome. Here’s my favorite among the Red Sox questions laced with optimism this spring: How much better can Mookie Betts get? We have to start with the acknowledgment that the 23-year-old center fielder is ridiculously good already – and he has arrived at the precipice of superstardom remarkably fast. At this point just two years ago, he was ticketed for his first taste of Double A baseball after blossoming into a genuine high-end prospect at two levels of Single A, hitting .314/.417/.506 with 15 homers and 38 steals. He continued to rake at Portland in ’14, slashing .355/.443/.551 in 54 games. Having conquered that level in a third of a season, the Sox promoted him to Pawtucket. He finished the 2014 season there with a .335/.417/.503 slash line in 45 games. While in Portland, he got his first call to the big leagues on June 29. Betts struggled in a 10-game initial trial with the Red Sox, hitting .235 in 34 at-bats before returning to Pawtucket in mid-July. His conversion from second base to the outfield wasn’t entirely smooth, either, with his GPS occasionally going on the fritz on fly balls. But when he came back for good in mid-August, he looked like a wholly confident and polished player. The evolution was evident in the statistics: Over the season’s final 39 games, he slashed .304/.391/.466 and played graceful, often spectacular defense. He hasn’t ceased being exceptional since. The best thing about the Red Sox right now, their biggest reason for hope of contention in the AL East, is that they feature two charismatic, established 23-year-old stalwarts in Betts and shortstop Xander Bogaerts. To me, Betts is the one more likely to play at a true All-Star level this season. Bogaerts still has some things to figure out, and I’m sure he will – just look at how hard he worked to prove he can remain at shortstop. But I’m not sure the power comes around quite yet, and that 80-point leap in batting average from 2014 to ’15 might not be entirely sustainable. I expect him to have an excellent year … even if in some ways it feels like a small regression from his dazzling and reassuring ’15 season. Betts? He’s already there. Stardom is his. He was worth six wins above replacement last season according to Baseball-Reference.com’s metric, sixth among American League position players. Anything above five is considered All-Star level. He slashed .291/.341/.479 with 18 homers, 21 steals, 174 hits, 92 runs, and 77 RBIs. In the second half, he hit .311 with a .359 on-base percentage and a .500 slugging percentage, clubbing 30 extra-base hits in 59 games. Betts just keeps getting better, which brings us back to that question: How much better can he get? In a sense, it’s hard to fathom that he can get much better. Every projection system I have seen – six are listed here – puts his estimated batting average in the range of .289-.303, his OPS from .828-.839, and his home runs from 16-19. That’s only an incremental improvement on ‘15, yet it’s still a hell of a season. Perhaps Betts will hit for more home-run power – he has four this spring, and ESPN’s Keith Law supposed before the 2014 season that Betts may have 20-plus-homer pop someday, an optimistic assessment at that point. His most-similar players list at age-22 is encouraging if you can ignore that the top three — Grady Sizemore, Carlos Beltran, and Ellis Valentine – were all eventually plagued by injuries. Andrew McCutchen doesn’t appear on his comp lists – his power developed earlier – but the Pirates’ superstar has some of the same talents and a similar appeal. In his age-23 season, McCutchen hit 16 homers, stole 33 bases, and slashed .286/.365/.449. It’s not that Betts could match that season; it’s that it would not be a surprise if he surpassed it. Will he? Well. that answer can only be unveiled over the course of a season. But Betts already has a knack for answering questions in a way that makes us marvel.